Waterway Point is a four-storey retail and lifestyle hub located in the heart of Punggol, beside Punggol MRT/LRT station. It is the retail component of Watertown, Singapore’s first integrated waterfront residential and retail development by the consortium of Frasers Property Limited, Far East Organization and Sekisui House Ltd. Watertown features a 992-residential unit development in addition to the retail and lifestyle hub. With a net lettable area of 370,824 sq ft, Waterway Point will offer a diverse range of retail, dining, entertainment and education offerings. Waterway Point will be the flagship waterfront leisure destination for Punggol’s residents and visitors from across the island. 2) Walk through Exit A and walk down Waterway Point's 24-hour Boardwalk. 1) Take Bus Service Nos: Nos. 3 (from Tampines), 34 (from Changi), 43 (from Upper East Coast Terrace), 50 (from Bishan), 62 (from Geylang), 82 (Punggol Loop), 83 (from Sengkang), 84 (Punggol Loop), 85 (from Yishun), 119 (Punggol Loop), 136 (from Ang Mo Kio). 2) Alight at Punggol Interchange then walk about 5 mins to Waterway Point. - Continue on Punggol Road and turn left onto Punggol Central. 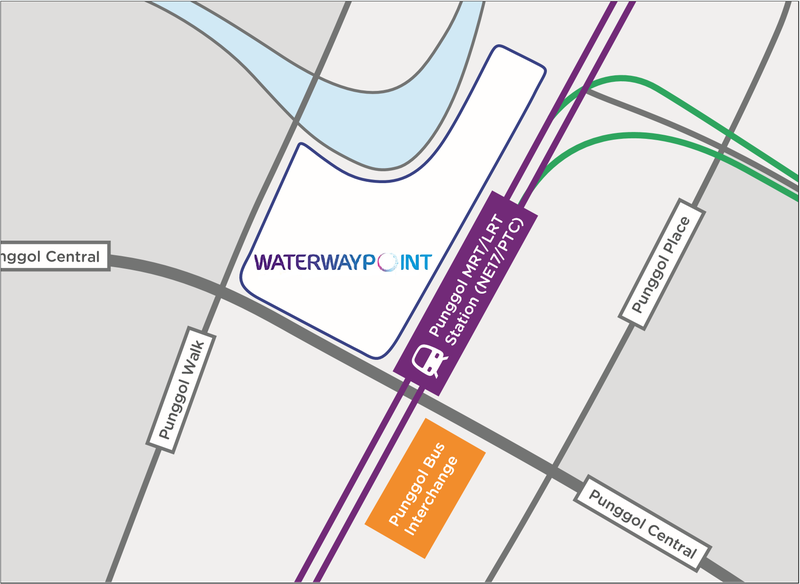 - Waterway Point will be on the left. ***All information is accurate at the time of updating the website. Visit Customer Service at East Wing, Level 1, or call (65) 6812 7300 for more information.